1 of 5 Heat oven to 400 degrees F. Fit one of the pie crusts into a 9-inch pie plate. Set aside. 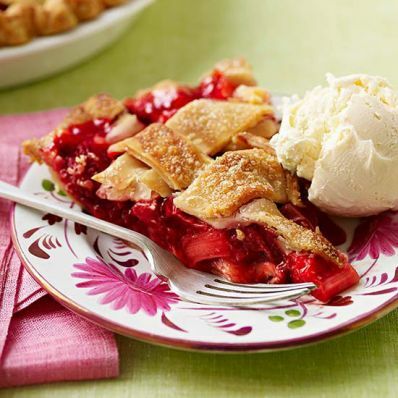 2 of 5 In a large bowl, toss rhubarb, strawberries, sugar-cornstarch mixture and lemon juice. Let stand 5 minutes. 3 of 5 Pour strawberry mixture into crust-lined pie dish, leveling slightly. 4 of 5 Using a knife or pizza cutter, cut remaining crust into 1-inch strips. Interweave into a lattice pattern. Crimp strip edges with bottom crust to seal. Brush crust with milk, then sprinkle with 1 teaspoon sugar. 5 of 5 Bake at 400 degrees F for 50 minutes, covering edge of pie with foil if browning too quickly. Cool to room temperature. Serve slightly warm with ice cream, if desired. Per Serving: 41 g carb., 10 g Fat, total, 7 mg chol., 4 g sat. fat, 1 g fiber, 136 mg sodium, 256 kcal cal., 2 g pro.